Why is it important to spend a good deal of time preparing the cement? More than 80% of coating failures can be attributed to improper preparation. Our state of the art preparation allows us to offer some of the longest warranties in the industry. Our DryPrep system uses diamond abrasives and carbide cutters to effectively remove old paints and effectively prepare concrete surfaces. Diamond abrasives flatten and smooth the surface, removing minor imperfections and often leaving it in better condition than the original poured floor. A separate dust collector allows the system to operate completely dust-free. Can I personalize my garage? 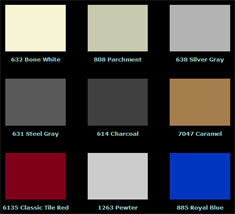 Yes we can add your favorite team's logo, patterns, lines or multi-color systems. Whatever you can dream we can do. Just give us a call we'd love to show you what we can do. The average 2 to 2 1/2 stall garage base cost starts at $2,000.00 and goes up depending on the actual size and desired system. 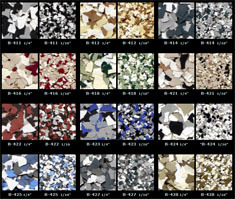 Upgrades to decorative mosaic and decorative quartz as well as excessive repair may be additional. Larger jobs the cost per square foot goes down relative to area..
We generally don't travel more than 30 miles from Grand Rapids as distance and travel add to the installation cost. If you have a project farther than 30 miles, feel free to contact us and we can discuss the added costs involved. How does your installation differ from DIY products? Preparation, preparation, preparation! Preparation combined with the use of industrial grade materials, the same materials used throughout abusive manufacturing environments. A D-I-Y kit can't provide the mechanical preparation equipment and vacuum systems needed to properly clean the concrete and create a mechanical profile suitable for high build coating installation. Can you remove old floor paints? With the use of our epoxy patch materials we fill all eroded areas in excess of 1/4 inch prior to the application of our finish coats. Can you repair rough or eroded concrete? In most cases a soft broom or leaf blower will take care of any dirt or leaves. In the case of oil stains a dilution of simple green or household degreaser may be required. Rust stains can be removed with CLR (Calcium Lime and Rust Remover) or Rust Out cleaners available at your local hardware or grocery store. Is there anything your garage floors can't stand up to? Yes, welding can create burn marks from the molten metal sparks that can be over 1,000 degrees F melting the resin. Some high performance racing tires can leave tire marks from leaching chemicals left over from the vulcanization into the coating. These tires generally have the speed rating of W, Y, and Z for speeds in excess of 149 mph. In the rare case of these racing tires it is best to use parking pads when storing. Please note sports cars such as Corvette's and Porsche's with factory tires that are designed to be driven regularly have not caused any issues. Our epoxy garage floor is so pretty I didn't want to walk on it. After we got the floor dirty, I couldn't believe how easy it was to clean.